Design is always a response to the problem or the context of the situation. In Jakarta, design is being used to deal with the rising problem of air pollution. Air pollution is a huge issue with levels of lead, carbon monoxide and nitrogen dioxide rising [Maulia, 2014]. These pollutants have a concerning impact on human health when inhaled, lead causing brain and nervous system damage, nitrogen dioxide affecting the lungs and carbon monoxide causing heart issues and blood poisoning. 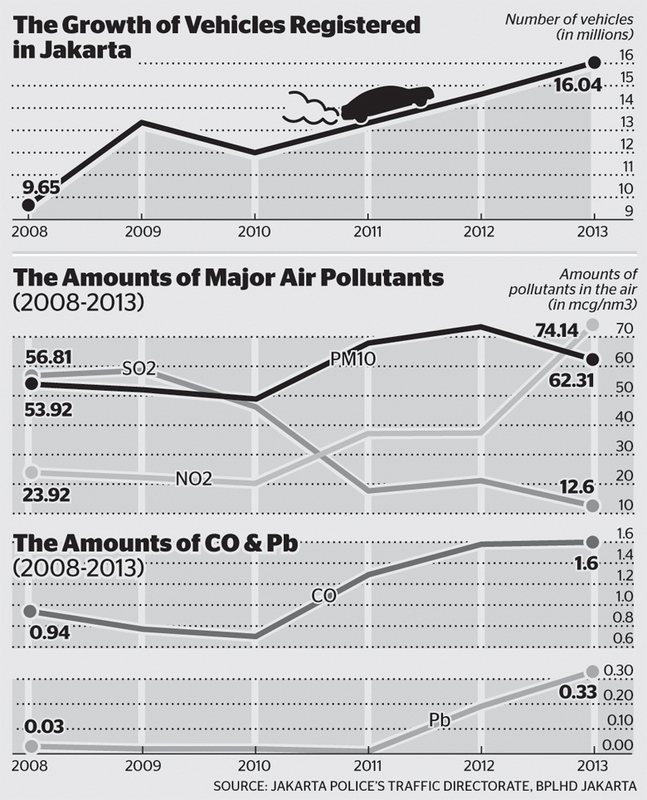 Those are all the scary facts about the problem of air pollution, so what is casing it? Jakarta is quite a harsh city to live in, it’s a high-rise city built in a tropical location with varying weather, high temperatures and a lot of people. Part of the issue is definitely transport and inefficiently running cars. Contributing to air pollution in Jakarta is the high rise office and apartment buildings across the city which require a great amount of electricity to run. Director of education ad training for the Green Building Council of Indonesia, Rana Yusuf Nasir, goes so far as to say that the “building sector had the greatest potential of any other sector for reducing greenhouse gas emissions, responsible for climate change”. Air-conditioning is the main contributor to energy use, 55% in fact [Arditya, 2015] so reducing that usage would reduce energy production needs and pollution out put from cooling systems. Its only takes simple architectural decisions to greatly reduce the energy consumption of a building such as double glazed glass and LED which reduce heat within buildings. These seem like fairly minor green decisions but can greatly reduce energy consumption. One design solution that combats both the issue of air pollution and heavy traffic in Jakarta is the the Transjakarta Busway. This busway works like a railway, with dedicated lanes to drive past the traffic (and heavy enough fines that people road users don’t try to use the bus lanes), overpass walkways to allow passengers to cross to the bus system safely without holding up traffic [Transjakarta, 2013]. The busway is also airconditioned which makes it appealing for city workers who can afford the slightly more expensive fare. The traffic problem in Jakarta is so great that this type of bus system was invested into with great results. Sydney would also benefit from such a system but maybe the problem isn’t great enough to force city designers to come up with a solution. Jakarta is a highly populated city with all the problems of densely populated places, but through design they are dealing with and combatting these issues to create a better, more liveable city. Arditya, A. 2015, ‘Saving and Shaving Costs With Greener Buildings’, The Jakarta Post, (Feature), Sun, February 08 2015, 9:41 AM. Maulia, E. 2014, ‘Jakarta’s Air Quality Takes a Toxic Turn for The Worse’, The Jakarta Globe, May 09, 2014. Transjakarta 2013, Information Services, PT Transport Jakarta, Jakarta, Indonesia, viewed 26/05/2015 2015, .